Cleopatra 2 online slot is a popular casino game that has been developed by IGT – a software developer and provider. It is a continuation of the Cleopatra series that was widely popular. In creating slot machine Cleopatra 2, IGT aims to entice more players to keep focusing on its thrilling casino games. Cleopatra is considered as the last of ancient Egyptian rulers. She was a member of the Greek Ptolemy dynasty and a descendant of Alexander the great. Further, her charm enabled her to rule for 21 years and her beauty, touted as the greatest the world has ever seen by historians, enabled her to control everyone. Hence, anyone who plays Cleopatra 2 slot game experiences the theme of Queen Cleopatra and is rewarded with free spins, bonus rounds, and payouts while ruling over wealthy ancient Egypt. There is a version for land-based as well as for online casinos to ensure that all gambling enthusiasts can play Cleopatra 2 slot machine at their own convenience. 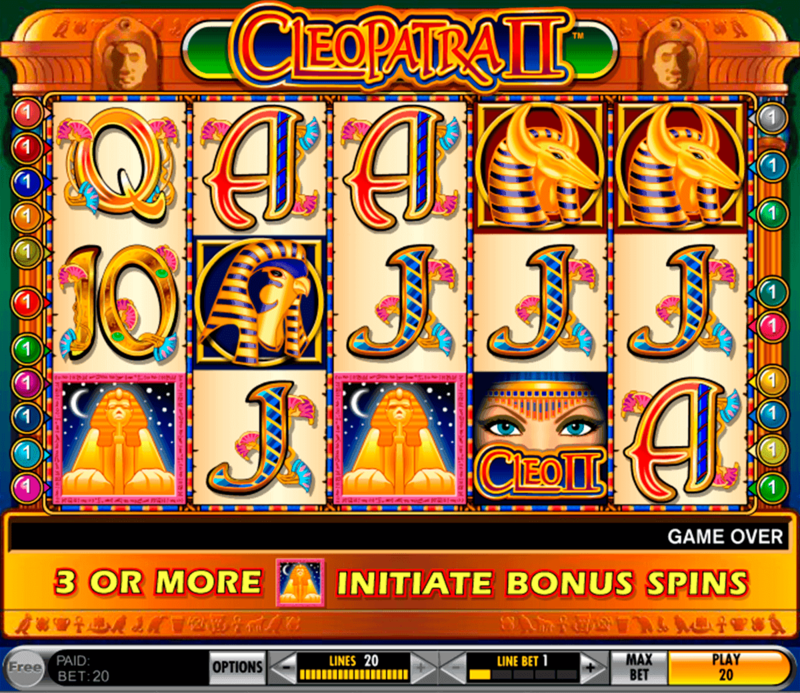 The online Cleopatra 2 slot machine and the land-based version have the same features. Firstly, it has 5 reels, 3 rows, and 20 pay lines. Although this may appear too standard to draw interest, the game has enhanced graphics and audio tracks that differentiate it from all others. Secondly, there are symbols such as Cleopatra, Beetle, Anubis Sphinx, Horus, Bastet. There are also card symbols such as King, Ace, Jack, Queen, and number 10. Lastly, the background of the reels and pay lines resemble a façade of what appears to be a palace. There are also hieroglyphics at the foot of the video screen that further enhance the ancient Egyptian theme. The Cleopatra Queen is the wild. It appears on the second, third, and fourth reels to replace all other icons except the scatter icon. It also acts as the joker in the game. Its other great advantage is that it triggers a double payout if it contributes to a winning combination hit. 5 to 15 free spins and 3 credits to the total bet respectively. A player has to select a tab to reveal the number of free spins before any of the free spins are awarded. It is important to note that the scatter symbol also results in wins based on multipliers. The only outcome that has to keep recurring is retriggering of additional free spins. 5, 4, 3, and 2 Cleopatra 2 symbols have a 10,000x, 2,000x, 200x, and 10x respectively multiplier effect on the stake. 5 of these icons hit a jackpot. 3, 4, and 5 of the Horus icon has a multiplier effect of 10x, 50x, and 250x respectively. The card symbols have the lowest payouts in the Cleopatra 2 game. All winning combinations have to appear left to right on active paylines to trigger payouts when playing Cleopatra 2 online game for real money. Overall, the game is less volatile and not progressive. The RTP is 95.13% that can be beaten through strategies such as selecting good casinos that give promotions on a cash basis. If a gambler chooses to play Cleopatra 2 slot online for free, there is usually no need for a bet deposit as the game versions are usually for fun on the no download no registration demo option. This can be used for practice by novice players delving into online gambling. You can enjoy free online Cleopatra 2 slot machine at our site. The free Cleopatra 2 slot machine online can be played on Android and iOS smartphones. It is also supported on desktop and tablet operating systems. Cleopatra 2 slot is an exciting game with attractive graphics and a thrilling adventure that is inspired by the ancient Egyptian kingdom. The wild and scatter symbols make it easier to hit the big wins as the multipliers assure a generous payout.